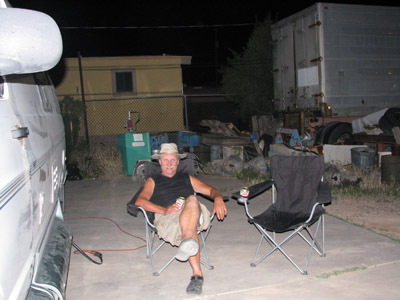 Despite many known options for Tucson boondocking, we ended up "camped" in a familiar location all weekend: the back of Herman's Transmission Shop. Ever since we received such good service at Hermans' Automatic Transmission in 2006, when we had an emergency transmission rebuild done, we've stayed in touch with 'the boys' in the shop. In fact, we never pass through town without a visit and count Herman, Rick, and their wives among our good friends. 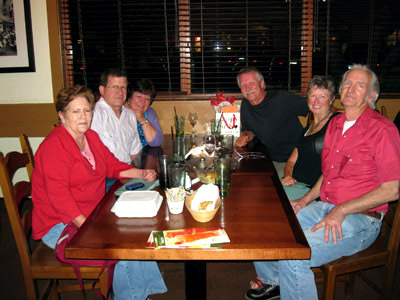 This week we happened to be pulling into town on Randy's birthday so it seemed fitting to invite them to join us for a little birthday dinner. We had a lovely evening and said our goodbyes with big hugs, expecting to meet again in a year or two. Not in a day or two! It was hot (in the 90's) here in Tucson this week but, one of the nice things about Tucson is, it is surrounded by mountains so, by Friday, we thought we'd treat ourselves to a campground at higher elevation. We were on the Mount Lemon Highway on our way to a National Forest Campground but, sadly, we never made it there. Without warning, the camper stalled and we just managed to get it to the side of the winding road. We could not get it to restart. Randy, with the help of a good Samaritan, tested a few ideas but couldn't figure it out. Of course, as bad luck goes, it was now Friday night. We had determined it had to be an electrical or computer issue (not transmission-related) but we contacted our friend, Herman, anyway. He suggested we get towed to his shop and he would solve it or help us find someone who could. Our week had started out so well. 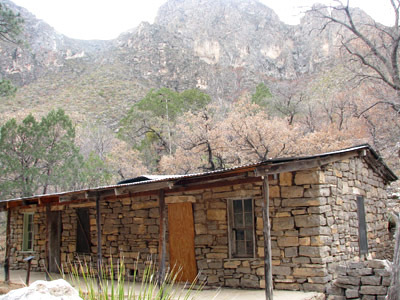 On the last leg of our Texas tour, we stopped in Guadalupe National Park where we hiked through McKittrick Canyon. 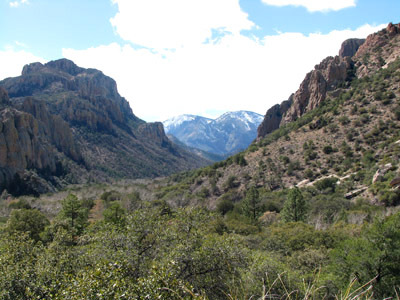 The 7-mile-round-trip hike follows a crystal-clear creek lined with lush vegetation in sharp contrast with the surrounding desert terrain. 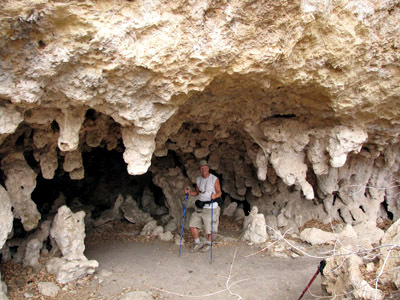 It leads to two historic cabins and a cave formation known asThe Grotto. 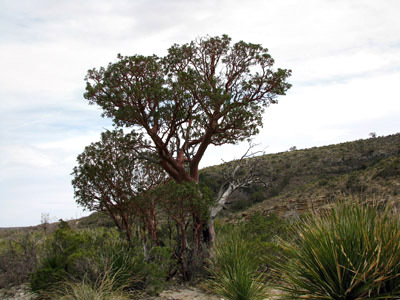 Red-barked Texas Madrone Trees line the trail. We said our goodbyes to Texas, and headed west for the next leg of our journey: touring Arizona. 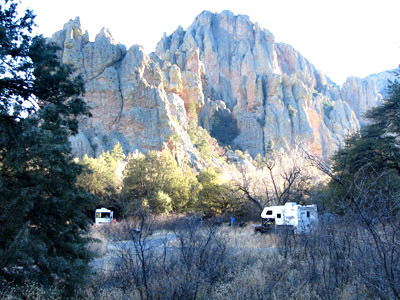 Our first stop was Sunny Flat Campground in the Cave Creek Area of Coronado National Forest, near Portal. 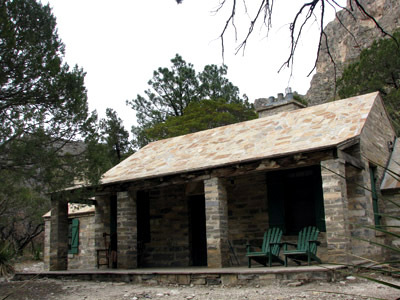 It's on the east side of the Chiricahua Mountains. With 360-degree, in-your-face, amazing scenery, abundant trees, and wildlife, this is one of the most spectacular campgrounds you'll encounter anywhere in the southwest. The cost? A bargain at $10.00 per night. Yet, here we were, mid-March Break and, if it wasn't for snowbird northerners, the campground would be almost empty. Our Ontario plates fit right in with those of our neighboring RVers who were from British Columbia, Alberta, and Michigan. 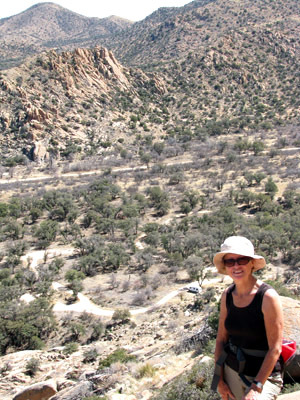 We moved a little farther west and, at Cochise Stronghold, hiked off-trail rather than repeat a longer hike we did there a few years ago. We climbed as high as we could go from our forest campsite onto a mass of granite boulders. 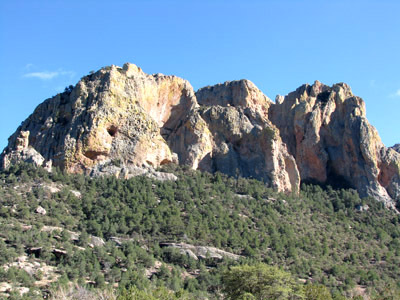 These are the Dragoon Mountains which, in the 1800s, protected Chief Cochise and his Apache Tribe from capture for nearly fifteen years. We had some most interesting visitors at our campsite. 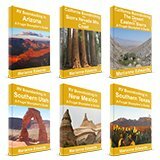 Our plan was to spend a few days in Tucson boondocking locations - just long enough to verify and, perhaps, add to the information in my guides. 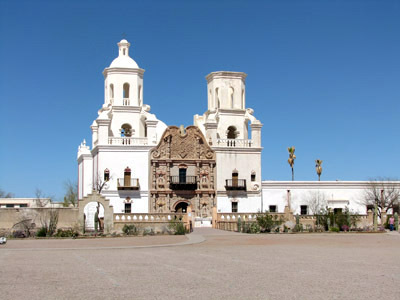 Although we didn't make it very far up Mount Lemon, we did visit other favorites in the area before the breakdown: Madera Canyon, Saguaro National Park, and Mission San Xavier del Bac. 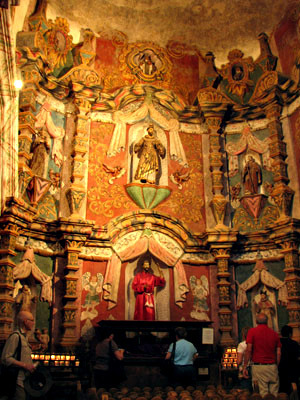 I was brought up Catholic so the practice of "lifting the head" of the statue of San Xavier at a side altar in the church had always intrigued me. 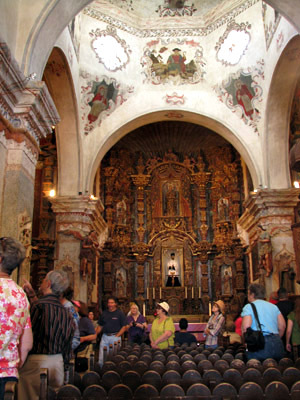 On this, our third visit to the mission over several years, I stood in line once again and repeated the ritual, then commented, "I can't believe how heavy it is" to which Randy (who was not brought up Catholic so doesn't participate) replied, "You say that every time." I decided to find out the reason behind this ritual and asked the museum attendant about it. She gave me this answer: "If you lift the statue's head and it's heavy, it means that you need to work on the spritual side of your life. If it's light, you're doing just fine". I guess I've got some work to do. Kinda wish I'd never asked. After determining that the problem with the van would require another opinion and have to wait until Monday, Herman and his wife, Pat, weren't just going to let us sit around all weekend. 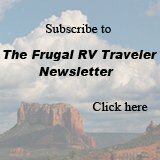 No indeed - even without an RV, our trip must go on. 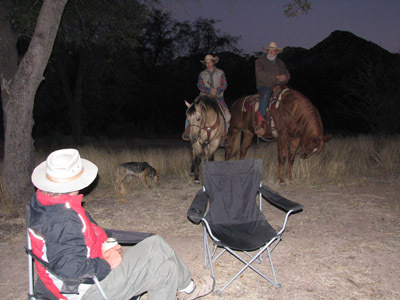 On Saturday they picked us up and drove us to Sonoita and Elgin. We didn't realize Arizona has some excellent wine country. 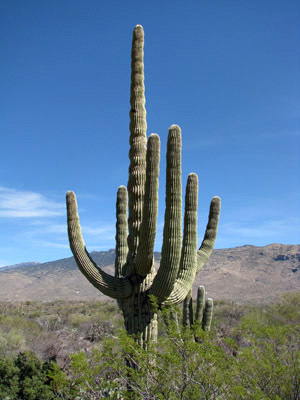 The vineyards are only a few miles southeast of Tucson. On Sunday, another road-trip, this time to Kit Peak was followed by a stop at one of the local casinos where, believe it or not, we all walked out winners! So, the week has been a mix of good and bad luck. But, perhaps I've left you worried and wondering what happened with our RV breakdown. Actually, I had hoped that by the time I finished writing this blog, I could answer that question. I can't tell you how it plays out because the final results are not yet in. The boys (Randy included) spent several hours yesterday running scans and tests, and consulting with other "experts" to figure out what the problem could be. Solving electrical and computer issues seems to be a tedious, time-consuming process - a matter of eliminating possibilities, one at a time. The final decision is still pending. Meanwhile we're thankful to be in the hands of mechanics who we can trust and to be allowed to camp in the secured lot (with access to water, a washroom, and an electric hookup). And, if that's not lucky enough, we can't put a price on the free education Randy is getting as the mechanics' apprentice! What have I learned? Sometimes on this trip we've wondered if we should be speeding things up - whether we'll have enough time to include all the stops we want to make. The lesson reinforced for us this week is that we always find time and money for unexpected delays and expenses. Why not make time, too, to pause for more of the small pleasures that, too often, we pass up on." I'm signing off with a final photo from our current, not-so-scenic but safe, comfortable, and all-too-familiar campsite: The back of Herman's Automatic Transmission Shop (and RV Campground). Sorry, this Tucson boondocking location WON'T be listed in my guides, but if you happen to need a transmission repair, these are your guys!